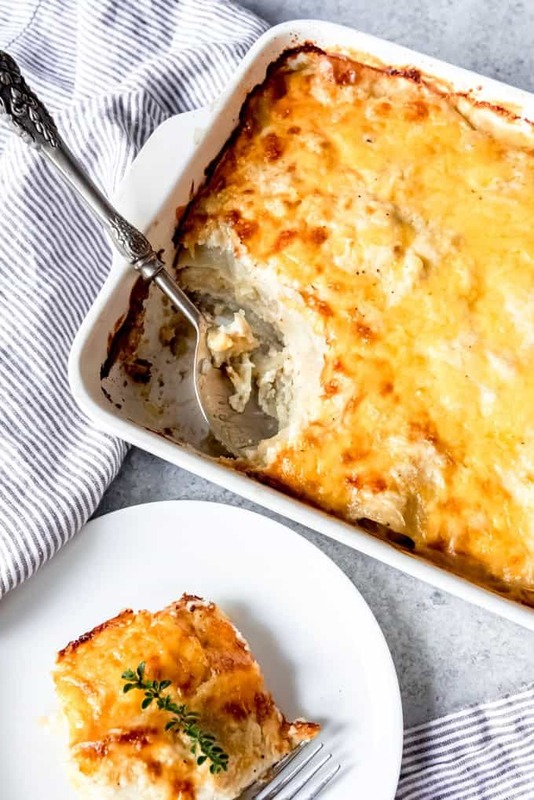 Layers of potatoes, cheese, onions, and a creamy sauce bake up into one of our favorite Easter side dishes of all time in these easy scalloped potatoes. Or au gratin potatoes. Whatever you want to call them. Either way we are talking cheesy, carby deliciousness made 100% from scratch. 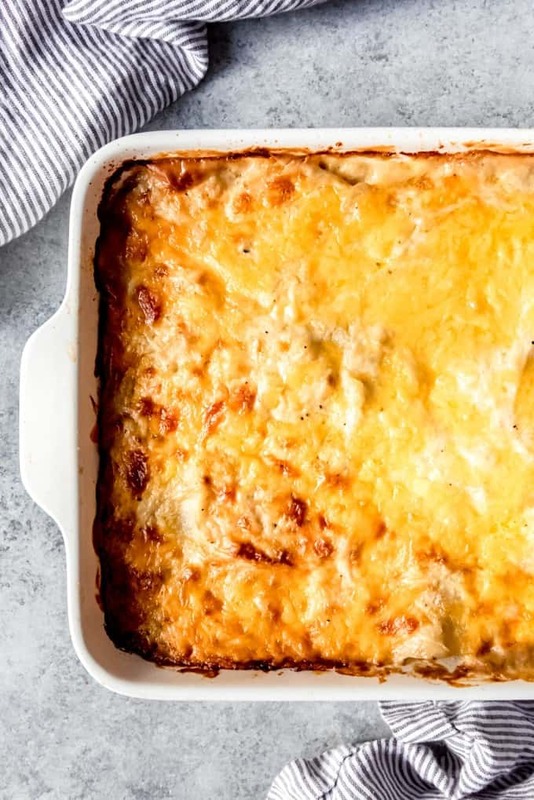 Cheesy, easy scalloped potatoes are possibly my favorite part about Easter dinner. Or okay, maybe the Lion House dinner rolls with raspberry freezer jam. Or the brown sugar glazed ham. I’m usually a pretty decisive person but Easter dinner tests my ability to make a solid judgement because the food is always just so good! 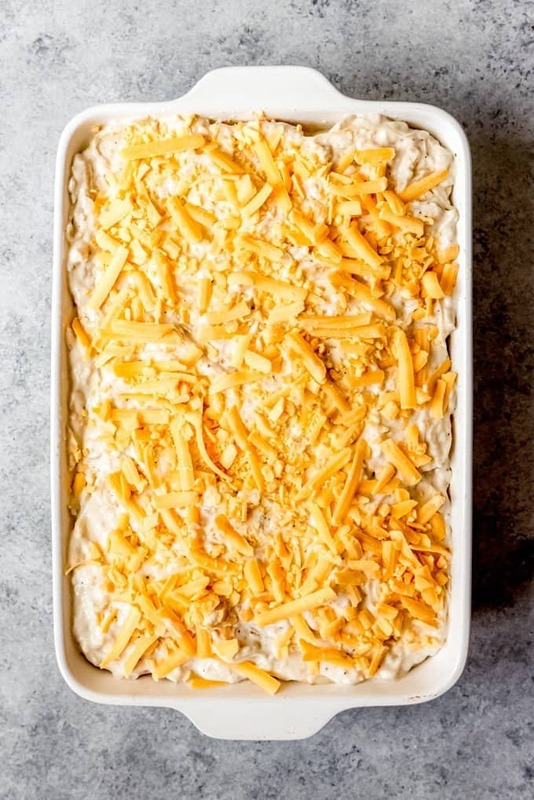 I don’t know if comfort food gets any more classic than when talking about warm, cheesy carbs. 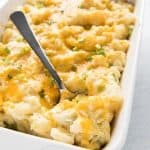 I posted one of my favorite cheesy potatoes recipes a while ago for the creamy potluck potatoes. 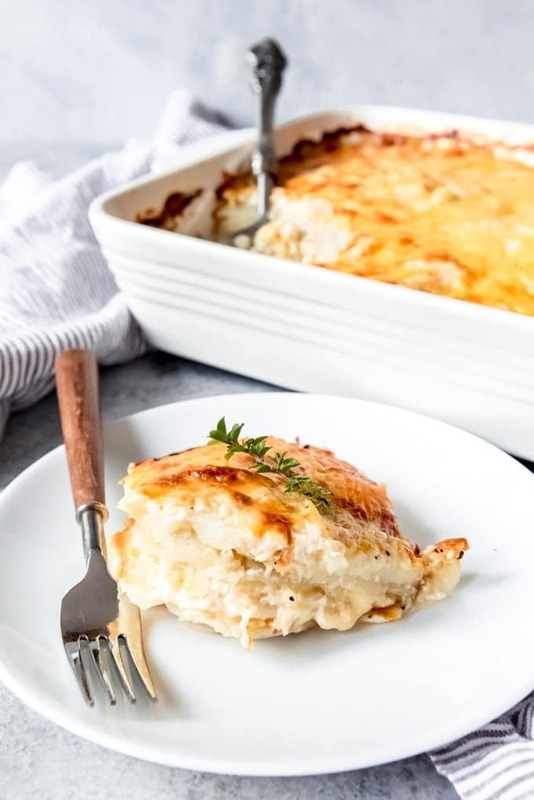 But these easy scalloped potatoes with a golden brown crust of cheese on top (which I guess qualifies them as au gratin potatoes) are closer to the ones I grew up with and I still love them for special occasions. My Aunt Renita was always the one to make the scalloped potatoes in the family. None of my three aunts on my mom’s side ever married or had kids, so my four siblings and I were the only nieces and nephews. Most Easters of my childhood that I can recall were spent visiting them in Utah and skiing every day in the week leading up to Easter. Those are happy memories for me. I loved watching my mom and her sisters work together in the kitchen to pull big meals together. 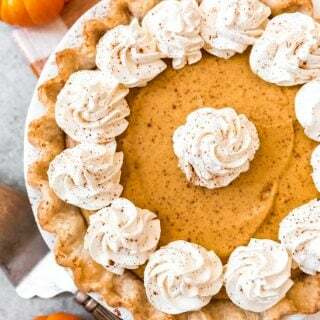 Aunt Renita made the potatoes, Aunt Judy made rolls, and Aunt Becky and my mom worked on the ham, lemon pineapple jello, sides and dessert, which was sometimes my Aunt Becky’s black forest cake if I was lucky. 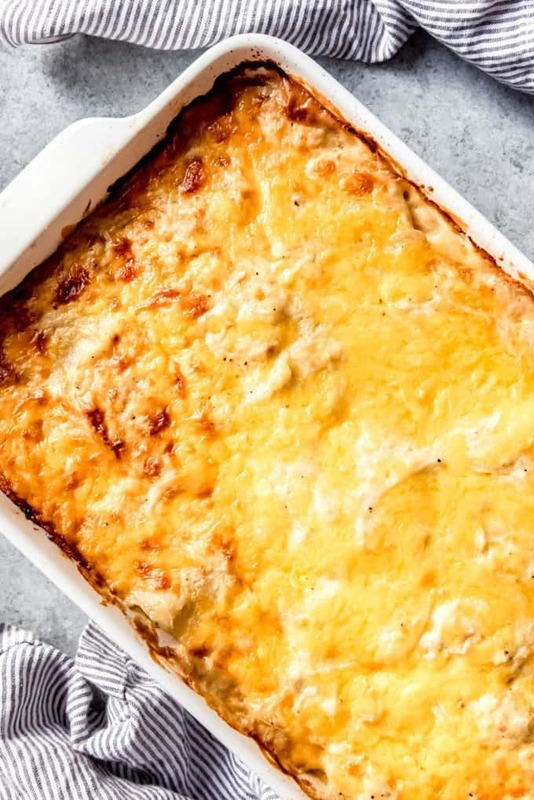 These easy scalloped potatoes aren’t quite the same as the ones my Aunt Renita would make though. Her method involved layering potatoes, onions, and cheese but she also made her scalloped potatoes with mushroom soup. 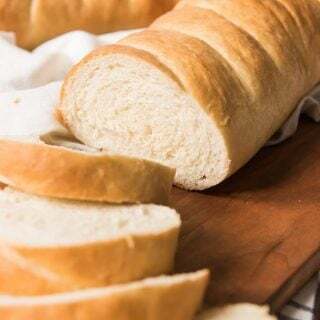 She would spread the cream of mushroom soup onto layers of thinly sliced russet potatoes, then pour a few canfuls of milk over the top of everything before popping the casserole dish into the oven to bake. I think I prefer making scalloped potatoes from scratch though since I rarely use those cream of something soups. 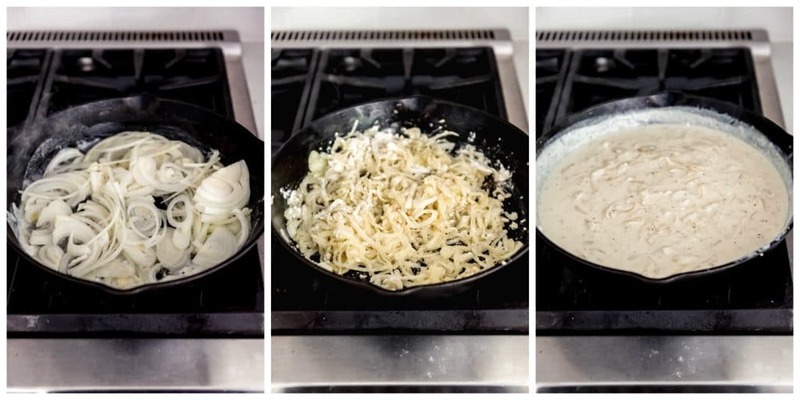 Not out of any high-minded principles or anything – I just prefer making a creamy white sauce from scratch and find that it hardly takes any time at all anyway. To make scalloped potatoes from scratch, start out by melting butter in a large skillet, then saute the onions until soft, about 5 minutes. Add garlic and cook another minute longer, then sprinkle with flour and whisk in both milk and cream. Season with salt and pepper and cook just until the sauce starts to thicken, then remove from the heat and set aside. Peel and slice the potatoes. 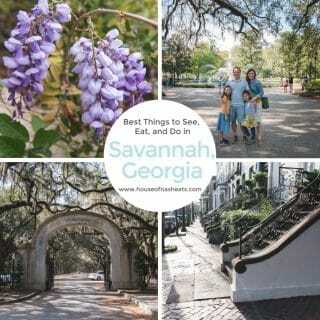 I typically slice mine about 1/8-inch thick, but you can do up to 1/4-inch. 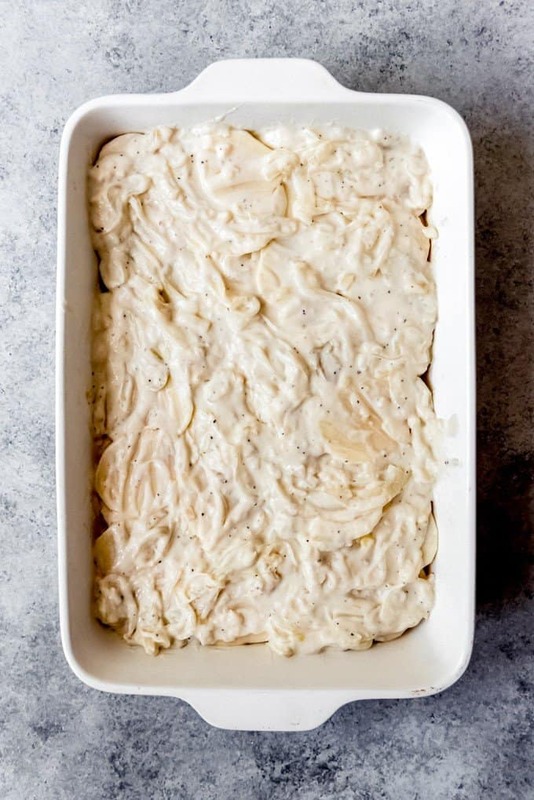 Once the sauce is made and the potatoes are ready to go, it’s just a matter of layering and letting the scalloped potatoes bake in the oven for a good long while until the potatoes are soft and everything is hot and bubbling! 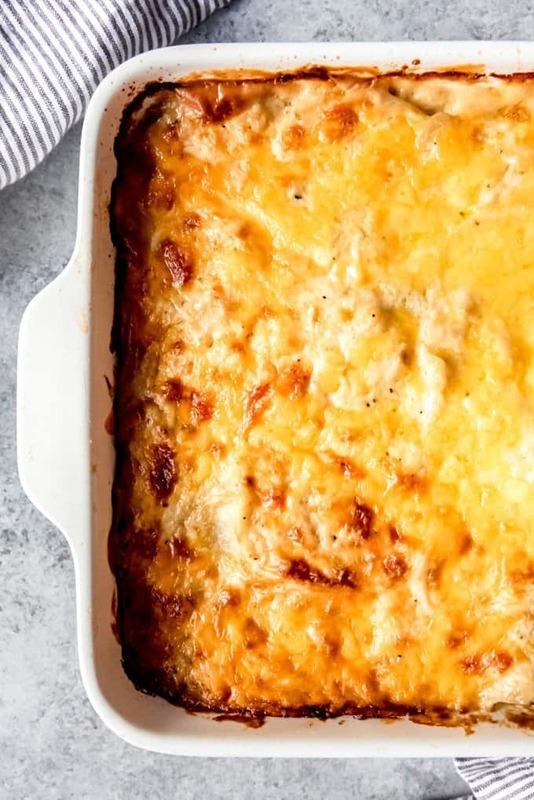 Then just cover the casserole dish with aluminum foil and bake for about an hour, removing the foil toward the end so the cheese on top gets nice and golden brown in places. 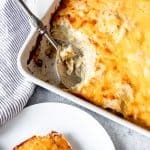 What Kind of Potatoes Should I Use for Scalloped Potatoes? I used russet potatoes, although Yukon gold potatoes work as well. 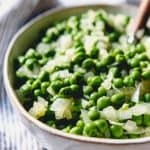 Both hold their shape and slice easily, especially if you have a mandolin slicer, which keeps the slices nice and uniform. That’s important because it will help the scalloped potatoes cook evenly in the oven. 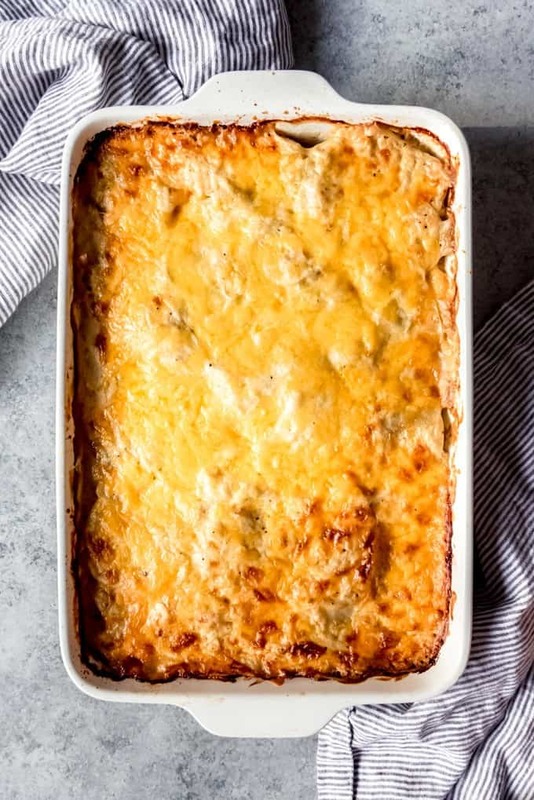 I grew up referring to this dish as scalloped potatoes and never being very clear on the distinction between scalloped potatoes and au gratin potatoes. 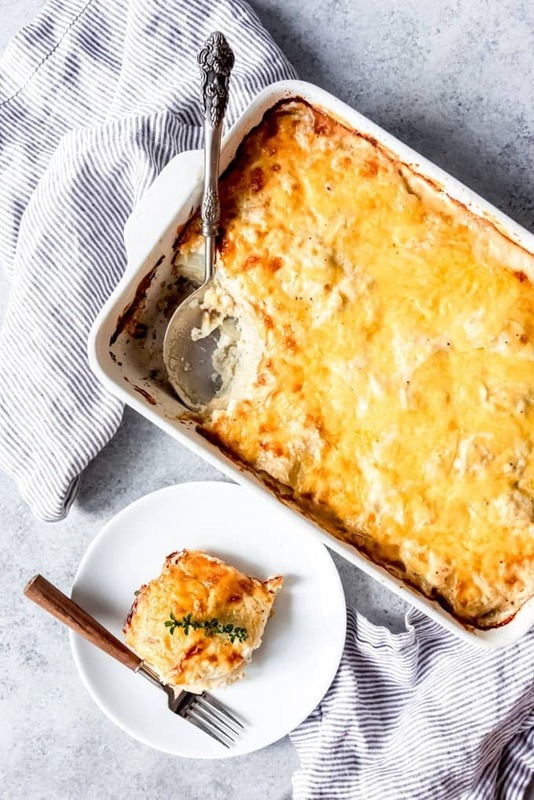 The thing that I think distinguishes them is that au gratin potatoes are covered with cheese and sometimes other toppings, while scalloped potatoes are made with a creamy sauce. 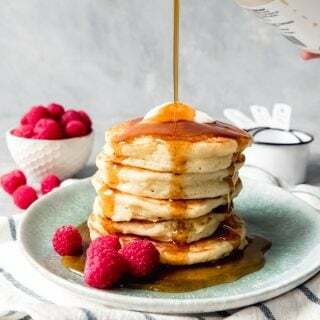 Melt butter in a large pan over medium heat. Add onion and saute for 5-6 minutes, until they begin to soften and turn translucent. Add garlic and saute another 1-2 minutes. 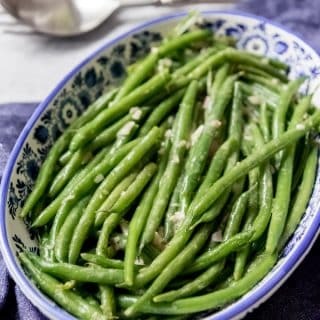 Sprinkle onions, butter, and garlic with flour and stir until evenly dispersed, continuing to cook for 1 minute. 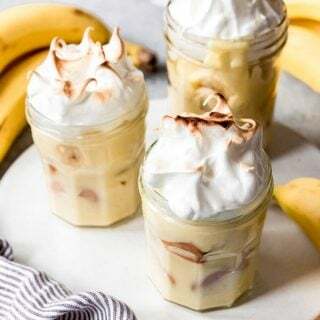 Slowly whisk in the milk and cream until combined so there are no lumps of flour. Add salt and pepper, to taste. Continue to cook for another 1-2 minutes, just until the sauce begins to thicken and barely starts to simmer around the edges of the pan. Do not let it come to a boil. Remove from heat and set aside. 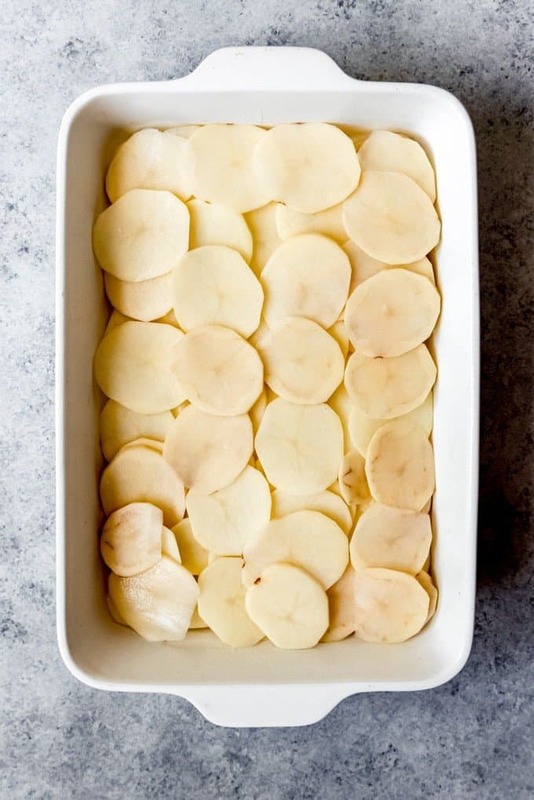 Spread half of the sliced potatoes in the bottom of the prepared casserole dish in an even layer. Top with half the sauce and onions. Sprinkle with half of the cheddar cheese and all of the Parmesan cheese. Top with another layer of the remaining potatoes, remaining sauce and onions, and remaining cheese. 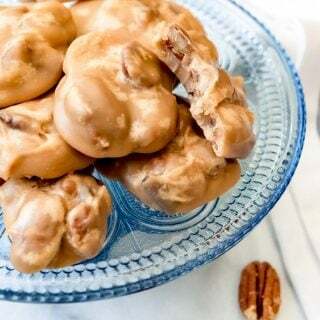 Cover with foil and bake for 45 minutes. Remove foil and bake uncovered an additional 30-45 minutes, until browned on top and potatoes are cooked through. 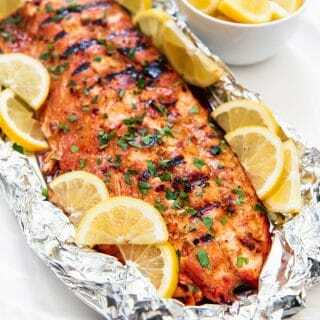 If the cheese on top begins to brown too much, recover with foil to finish baking. Really, any melty cheese will work well here. 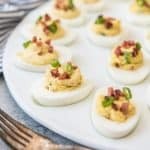 I have used a combination of sharp cheddar with either monterey jack or gruyere before with wonderful results, but you could also try gouda, mozzarella, or fontina as well.